"The role of Garlic as an antiviral and antibacterial agent is unsurpassed. There are no...repeat, NO...modern antibiotic drugs in the entire arsenal of medical science that even come close to doing what Garlic can do." Nutritionally, garlic is high in chromium, phosphorus, protein, selenium and thiamine. 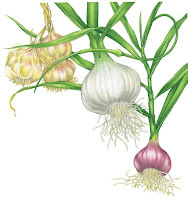 For normal internal use, Philip Fritchey, in Practical Herbalism, recommends garlic juice at 1/2 to 1 tsp, 3-4x/daily; whole raw cloves at 1-3 daily; powder at 4-8 large capsules, 3-4x/daily; tincture 1/2 to 1 tsp, 3-4x/daily; syrup 1-2 tsp, 3-4x/daily; and oil 1/2 to 1 tsp, 3-4x/daily or every hour for acute conditions. James Duke in his Green Pharmacy Herbal Handbook agrees that using garlic whole is better than any processed supplement available and recommends eating 1-5 cloves daily to treat various ailments; juice and syrup in the same amounts as Fritchey above. To make a garlic poultice, which is great for treating children, place a few cloves of crushed garlic in a small piece of thin muslin or cotton (an old t-shirt works well)...even a paper towel works; fold into a little square packet, moisten with hot water, gently press excess water out, and apply. It helps to tape on the poultice packet with surgical skin tape (this can be acquired at medical supply stores or drugstores). The best application place for a poultice when fighting infection is the bottom of the feet. The pores there are larger than other parts of the body; the medicine is more quickly absorbed through the skin and passes into the bloodstream. These poultices may also be used on the chest and back for respiratory illnesses; garlic is a useful expectorant and can help expel phlegm from the lungs while it works to combat the infection. Rub a bit of olive oil on the skin first to prevent any possibility of burning; check the skin every few minutes to be sure the garlic juice is not causing any irritation. Keep the poultice on for 10 minutes if possible and do this procedure throughout the day...every 1-3 hours depending on severity of infection. Garlic poultices are also effective on acute, localized skin infections...apply where needed. Garlic is excellent for drawing out infections and toxins, and promotes healing. Slices of garlic can be applied directly to the skin for treating such things as warts, infected wounds, skin cancers, etc. To avoid burning yourself, be certain to apply a thin layer of oil to the skin before the garlic.